KEEPING THE WHEELS TURNING, ONE RACE AT A TIME. We've just returned home from our annual beach week, which seemed most special this year. Knowing this would certainly be our last trip before the oil ruins it for us all, we treasured the squeak of the white sand, and ignored the accumulation of green seaweed in our bathing suits. We swam with turtles, dolphins and rays, and shouted in vain, "go east!" I've been moving in the Gulf waters with these creatures since I was a small child, and their fate has me somewhat consumed and emotional. Sharing this week with my family reminded me of how lucky I am to have people in my life who love my boys so much that they will follow us to the ends of the earth to enjoy a little piece of BMX action. I hope the boys grow to appreciate it too. 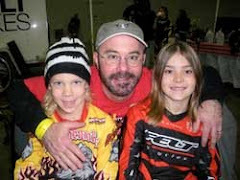 From the earliest races, BMX has been a family affair. My dad (pictured with William and Wyatt at the 2007 Easter Classic) has been a staple from the beginning, never wanting to miss an opportunity to brag on his grandsons. He's a huge help too: collecting trophies, swapping out a 20 for a cruiser in staging when motos run tight, and often occupying Wyatt who tends to get restless off the track. The boys' Aunt Ryland and Uncle Greg also have a high attendance record. (Pictured: Wyatt with his Uncle Greg in St. Pete.) Over the years, they've followed us all over the state of Florida for weekends of fun in the dust and port-o-potty experiences. Ever since the birth of their precious twin girls last September, spontaneous outings have been a little more challenging. However, they still managed to bring my adorable nieces to watch their big cousins race in the Easter Classic in Okeeheelee this past April. Now that's devotion! We've got two Redline minis set aside for the girls, and can hardly wait for them to get on a track. Although, we'll be equally stoked to see them in leotards at dance recitals and gymnastics meets. The most family we ever had at one race was in Morristown, TN at the 2009 Thanksgiving Nationals. We had my lovely sister Wendy (check out her blog), her husband George, my dad, Uncle Jack, who is never seen without a cowboy hat, and his daughter Elizabeth, who is ever-stylish and oh so frightened of public restrooms. My cousin Judy and her husband Shane also made an appearance. This was an unusual group in many ways, and I'd have to start a new blog to write about them. It was an impressive fan club, and they all saw Wyatt bring in his first win that weekend at the US Open (pictured). The beauty of this is that all these people trekked across country because we decided to race Thanksgiving weekend, and they wanted to be with us. That's something special! It was a memorable family weekend complete with a crazy mountain cabin and a trip to Dollywood. I truly wish I had a photo of all of us at the race, but alas the opportunity has passed me by. Now that we are spoiled from all of this attention, we're hoping for a big family turn out at this September's Grand Nationals in Louisville. The drinks are on me--- Meet me at the Embassy Suites at 5. I'm so happy I got to steal a few moments on the beach with this fun family! I collect Wonder Woman t-shirts, and I love cheese.